Second Life were a German power trio from Bad Camberg close-ish to Frankfurt. The line-up consisted of guitarist/vocalist Holger Schmidt with Karl-Heinz Traut on drums and Klaus Meinhardt on bass. They made one self-titled album on Metronome in 1971 before morphing into Tiger B. Smith and having some success on the seventies live circuit supporting contemporaries such as Deep Purple, UFO and fellow countrymen The Scorpions – other bills were shared with disparate acts such as Dr. Hook and Elkie Brooks, more of a mismatch than an attempt to put on an eclectic show. But Tiger B. Smith more probably fell in between the genre cracks as they attempted to adjust to the changes in the seventies underground and might have been more at home with the Glam bands as early seventies Rock was left behind. 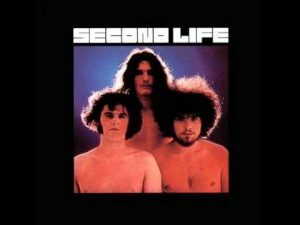 Second Life formed in 1969. They were closer in sound to a heavy Cream or Vertigo’s Freedom (Through The Years also 1971) with louder guitars, Blues Rock with lots of noise, drum solos and long instrumental passages – the first song and title track is 20 minutes long, taking up all of side one. Chunky and in your face, riffs and jams, singing in English with German accents aping Americans, not really about the songs but more about the era – it’s the transportation to 1971 that is their appeal. Starting (and ending) with a massive explosion and then acoustic guitar, lyrically it sits somewhere between despair and hopelessness that almost reminds me of a German Eric Burdon. It’s not long before the jamming begins, not scared, dueling overdubbed guitars dominate the speakers till the drums take over in a rather long solo that will definitely have you running away screaming if it wasn’t for their indulgent bravery and fabulous sounding deadened toms and thudding bass drum. Track one, side 1 (I think) I’m Going, a sing speak observation of the demise of hope, a pessimistic, suicidal statement with some sweet echoey wah-wah guitar and background arpeggio. Schmidt’s guitar riffs sometimes sound like Tony Iommi’s riffs without a fuzz box on Raiders Of Night and sounding like Blue Cheer on Sunshine Is Dying also without the fuzz box. It’s music for parents to hate, music that parents can’t understand and interestingly music that might be a struggle for anyone outside the era, whatever their age. It’s too basic for the thoughtful, without virtuosos and song wise might not stick in your brain. But, closing the album, Hate, although it might steal from Chicago’s 25 0r 6 to 4 manages to have a memorable tune and despite some first take rhythmic crashes between the bass and the drums, is the best actual song on the album. It’s back to the feeling of the day, the post war depression, the frustration of youth expressed in long hair, blasting amps and the luxury of the freedom to be angry. There is little written about Second Life, nothing on German wikipedia and their album is so rare that the reissue CD’s that did make it out in very limited editions are also out of a sane person’s price range. I simply cannot recommend this album to you but found myself thoroughly enjoying it, listening through twice, I long for the uninhibited, the uncontrived, I love the lack of expertise, the missing producer, the band recorded so basically with little input needed to capture their rawness. It was the days before producers were brainiacs that needed to understand the technology, an era of quality guitars, quality mixing desks and microphones. It was musical knowledge that started with the ears, it was before the rules came in. Something is captured here, there is forgotten knowledge. Last but not least before you listen to this record, buy a proper stereo, speakers with bottom end, a frequency range that you don’t just hear, you feel. Don’t let the propaganda replace your treasured sound system and the real audio musical experience. Remember when they told you to sell your vinyl and get CD’s well now they’re at it again telling you to stream it and listen on a small plastic tower that amuses by talking back to you, confusing you with the convenience of it all. Do not surrender or better still, come to my house and listen to how music is supposed to sound.